Curious little minds will love the experiments, workshop ideas, and many discoveries this theme provides! Children sit in a circle. Ask a child to whisper a word into the ear of the child sitting to his right. This child then whispers the word into the ear of the child sitting to his right, and so on until the word has travelled around the circle. Ask the last child to say the word out loud. Play this telephone game as long as you want. Explain how the telephone is an exceptional scientific invention! Set up a science corner which can be enjoyed throughout the theme. If you already have a permanent science corner within your daycare, change its setup to renew children's interest. Display a poster of Globule (Open Globule). 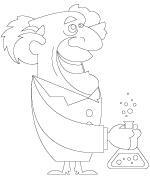 He is the perfect character to introduce children to their new science corner. Display other science-related posters on the wall. You may also hang a few from the ceiling. To complete the corner, prepare a thematic bin complete with a variety of items which will encourage scienctific play and discovery. You may even hang a few white shirts or smocks on hooks. Children will love wearing them and pretending they are little scientists. Thematic bin: magnifying glass, safety glasses, rubber gloves, dropper, measuring cups, funnel, sea shells, rocks, magnets and paper clips, coloured rice, tongs, cotton balls, beans, mirror, small lights, small notebook, crayons, pebbles, cones, balls, dried leaves, seeds, buttons, empty bottles, flashlight, plants, etc. This theme is perfect for exploring the density of various materials along with their shape. Use hard blocks (wooden) and soft blocks (foam) to make comparisons regarding textures and weight. Various shapes of blocks and balls (if you do not have round blocks) to compare and make all kinds of constructions. Various means of transportation (4 wheels, 2 wheels, no wheels, with wings, without wings) to encourage children to make comparisons. Introduce children to color combinations. Blue, red, and yellow poster paint (primary colours) can be mixed together to make green, purple, orange, and brown (when all the colours are mixed together). Different colours of tissue paper and white glue can be used to layer colours to see new colours appear. Transparent colourful paper (cellophane) is also great for layering. It can also be used to see through and appreciate colours. Why not make glasses like the ones used to watch 3D movies? Explore careers and professions related to science such as chemist, biologist, scientist, etc. White shirts or smocks with glasses. Measuring cups, droppers, bowls, measuring spoons, balance, toy microscope, funnels, straws, containers in different sizes, etc. Magnets impress children. They will have fun playing with them in a variety of ways! Magnets with a variety of objects to explore which items are attracted to magnets. Various magnet shapes (birds, characters, etc.) and a metal cookie sheet. Let children create stories and scenes. Visit your local library. In the 9-12 year old section, you will find books which illustrate the steps involved in a variety of scientific experiments. Magnetic books, children love creating stories. Balloons which can be inflated (have several on hand) and then rubbed on children's hair to create static. To the sound of music, throw them in the air and watch them stick to the ceiling. A feather or a Kleenex which can be thrown up in the air. Encourage children to sit down before they touch the ground. Teach children to juggle...to explore gravity! Rice, sand, pasta, or water bins are all interesting for this theme. They all have different properties. Water table with objects that float and objects that sink. Certain objects sink slowly while others sink instantly. Have children make predictions! Guide children through various experiments to avoid messes. Experiment with hot and cold. Pepper is afraid of soap! Let your imagination guide you...you can demonstrate experiments or let children manipulate everything. The pictures may be used as a memory game or to spark a conversation with your group. Use them to decorate your daycare or a thematic corner. (Open picture game-Science) Print, laminate, and store in a "Ziploc" bag or in your thematic bin. Invite children to examine their reflection in mirrors of different sizes. Place the mirrors at various distances. Make funny faces. Discuss. Fill several containers with water. Provide exploration material: small spoons, measuring cups, funnels... Children can observe how water pours differently, depending on the container. Variation: notice how certain objects float while other objects sink. Deposit several objects in a paper bag or in a box. Use objects children are familiar with. They should have different sizes and textures. Have children close their eyes or blindfold them. Invite children to take an object using their hands and feel it to try to guess what it is. Give each child an inflated balloon. Have them rub their balloon on their hair and stick it on the wall. Deposit a variety of objects on the table (nails, paper clips, coins, elastics, aluminum, crayons, blocks, lipstick, etc.) Place a magnet near each object, one at a time. Sort the objects. Place the ones attracted to the magnet in one container and the ones which are not attracted to the magnet in another container. Help children identify which metals are attracted to the magnet. 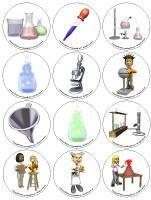 (Open story and memory game-Science) Print, cut out, and laminate the illustrations. Place them face down on a table or on the floor. Children pick three illustrations and invent a story involving the illustrations. (Open story and memory game-Science) Print two copies and cut out. Glue the illustrations onto the top of frozen juice cans. Attach a magnet to the end of a fishing rod (stick with string tied to the end of it). Deposit the illustrations face down on the floor. Children pick two illustrations. If they are identical, they keep them and play again. If they are not a match, their turn is over. Fill a bin with rice. Add figurines, measuring cups, containers, utensils, etc. Children will have fun manipulating the material. Fill two or three empty boxes with different types of fabric. Make 2 ½ to 3 centimetre holes in the lids and place them on the boxes. Secure them using adhesive tape. Invite children to place their hand inside the boxes and describe what they feel. Pour sparkling mineral water into a glass. Add a few grapes. After a few minutes, they will begin to move. Add a few drops of food coloring (blue or red are best) to a glass of water. Place a celery stalk (with leaves attached) in the glass of water. Let stand for a few hours. Notice how the leaves have changed color. Pour water in a glass until it is almost half full. Add honey. Watch what happens. The honey will remain on the bottom of the glass even if we stir the water. Add oil. The oil will remain on top, even after being stirred. There are now 3 levels in the glass. Pour water in a glass until it is half full. Sprinkle baby powder. You must see a thick layer on the water. Gently plunge your finger in the water and remove it just as gently. Your finger will be dry! Pour water in a glass until it is half full. Sprinkle the water with a layer of pepper. Pour dishwashing liquid into a small container. Dip your finger into the soap, and then in the water. The pepper will run away from the soap! Provide each child with a small glass of water. Add a few drops of dishwashing liquid in each glass. Give each child a drinking straw and a sheet of colourful construction paper. Children dip their straw in the glass and then blow on the construction paper to make a bubble. The bubble is gently deposited on the construction paper. Children will love observing it from every angle. Have children sit in a circle. Place a candle in a candleholder. Deposit the candleholder in an aluminum plate in the center of the circle. Watch the candle closely. Notice how fire is beautiful. Discuss the dangers related to fire. When you are ready, gently place a glass jar (2-litre capacity) over the candle to snuff out the flame. Cut a potato in two. Leave one half out on the counter and place the other half in water. Watch the changes throughout the week. Take a walk outdoors, in the forest if possible. Try to identify the animals the tracks you see belong to. When you are outside, look closely at the clouds. Examine their shape and try to find ones which look like various objects. Outdoors or using a sand table, build canals and rivers. Then, block off certain areas by building a wall (with sand) or depositing objects in the canals and rivers. Ask children to watch what happens when you add water. Set a transparent container outdoors on a rainy day. Then, bring it inside and observe the quantity, the colour... Use a magnifying glass or microscope. Add a drinking straw to children's milk glasses. Let them blow bubbles. Collect small film containers. Add Jell-O powder. Prepare several containers and make holes in the lids. Invite children to guess the flavours which are in the containers. Mix poster paint with a small quantity of water. Using a paintbrush, let a drop of colour fall onto a sheet of paper. Encourage children to blow on the drop using a drinking straw to spread the paint. A simple way to make finger paint is to pour liquid poster paint into a bowl, add a small quantity of flour, and mix until the texture resembles the texture of store-bought finger paint. Let children dip their fingers in the paint and make prints on paper. Pour salt onto a sheet of paper. Add colourful crushed chalk to dye the salt. Pour the salt into a container and repeat using a different colour. Use the salt for special collages. Simply apply glue to a piece of cardboard and pour the salt over it. This is a great way to discover the magic of colours. Make pinwheels (Open craft-pinwheel) Print the model onto heavy paper and cut it out. Cut the paper from the outside corner to the center. Fold every other point towards the center. Use a fastener to hold everything in place. Add a drinking straw. Children will love blowing on it or running with it outdoors to make it spin. Angélique Boissonneault worked in a laboratory and was able to put her scientific knowledge into practice. She is a math, chemistry, and physics teacher but also developed a simple approach which involves renewed scientific experiments for young children. You may be familiar with some of these experiments, while others are not widely known. She presents Globule, your guide for her two passions: science and children. Why do objects thrown in the air always come back down? Ask children why everything we throw up into the air falls back down to the ground. Have them predict what will reach the ground first if we let a sheet of paper and a book fall to the ground at the same time. If we crumple up the piece of paper, will the result be the same? Ask them why all objects fall to the ground instead of floating in the air. The daycare worker chooses a child to stand on the chair. The other children sit on the floor, not too close to the chair. The child on the chair holds the first two objects (book and smooth sheet of paper) in front of him horizontally and at the same level. When the daycare worker gives the signal, the child lets go of both objects at the same time. Watch how the sheet of paper gently dances in the air as it goes down. As children probably predicted, the book hits the ground first. Another child stands on the chair and repeats the experiment with the same book. This time however, he holds a crumpled piece of paper in the other hand. Is the result different? Finally, another child climbs onto the chair. He places the smooth sheet of paper on the book and drops them. What happens? Try a variety of different objects. At first, you probably thought the book would touch the ground first since it is heavier. However, once the piece of paper was crumpled, they hit the ground at the same time! Funny, since it is the same piece of paper and the book is still heavier. It all comes down to form. When the paper is smooth, it exposes a large surface to the air beneath it which slows its descent. Once it is crumpled, the surface which comes in contact with the air is much smaller, allowing it to fall much faster. When the sheet of paper is placed on the book, there is no air at all beneath it. For this reason, the two objects fall at the same speed. This force is called gravity. It attracts objects to the ground like a magnet. All objects are attracted to the ground by the same force, gravity. They all fall at the same speed unless air offers a resistance strong enough to slow them down.